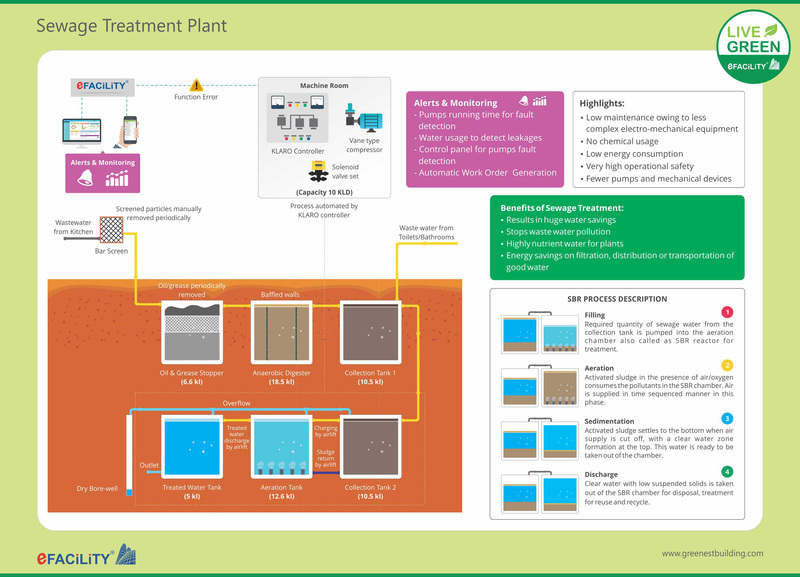 100% of the waste water, grey water and sewage is recycled using the Advanced Sequencing Batch Reactor (SBR) from KLARO, Germany. The treated water is used for flushing and gardening leading to enormous water savings. The system operates fully automated and requires very low periodic maintenance as well. The kitchen water is passed through a grease trap and an anaerobic digester – to reduce the oil, fats and grease entering into the SBR. The treated water from the SBR is filtered using a pressure sand filter and an activated carbon filter and at the delivery point, it passes through the UV filter as well to reduce the suspended impurities and control the microbial growth. The recycled water which has high level of micro-nutrients is very good for gardening and caters to the complete gardening and flushing needs of the facility.